Athens, Sunday 09.05.2004. 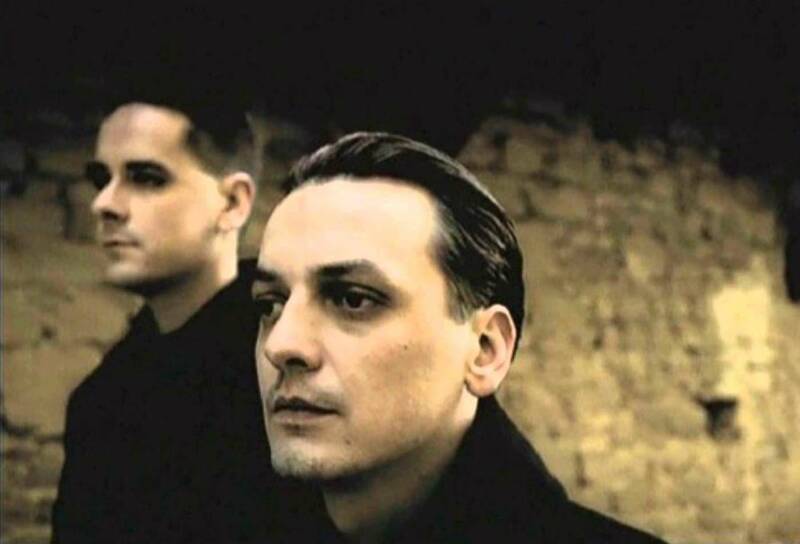 The Greek audience had the privilege of watching the most important German synthpop band of our times playing live at the country’s most successful electro festival to date. We are talking about Wolfsheim, who were headlining the 3rd Elfentanz Festival. After a memorable sold-out concert, Lost Echoes.net had the unique opportunity to take an exclusive interview with Peter Heppner and Markus Reinhardt and ask them what we always wanted to find out…”. LE: Will there be a new single from Casting Shadows? Which song do you think would make a good next single, and when is it going to be released? Markus Reinhardt : I love “Approaching Lightspeed”. But we really love the whole album. Peter Heppner : We love all the songs of the album. That’s why they are in the album. Markus Reinhardt : But the next single will be “Wundevoll” and it will be released in autumn. Peter Heppner : It is very difficult for us to choose the single, because every song of the album is very important. The album wouldn’t be complete without one of the songs it has now. So it’s always a real problem to choose a single, except with Kein Zuruck. It was absolutely clear that we had to choose this song because it’s a very special song for us. LE: Wasn’t it the obvious choice for the first single? Peter Heppner : Not for everybody. We had real problems with it because it wasn’t the favorite song of our record label. They wanted us to release an English song, a more danceable track that would be more radio-friendly. Their reaction to our choice, about Kein Zuruck, was that it is a German song, it is very deep and kind of sad and melancholic. They though that Kein Zuruck was not the song that someone would want to play in the afternoon or at their office, because people want to listen to lighter songs at that time. But it is not a sad song. Maybe it is melancholic. It is not a one-way street, or a dead end, it’s a song that makes you think about your life and if you go sad while thinking about your life then you have a problem with life and not with the song. So that’s the answer again to people. LE: While we’re talking about Kein Zuruck, which is your most successful song to date, even thought it seems like a melancholic song there is a sense of optimism in it. How did the song come about? How did you come writing the song, the music and the lyrics? It seems like a very personal song to you. Peter Heppner : It is personal. But everything we do is really personal. That’s one of the reasons why we don’t answer to personal questions. Our music is personal enough so you don’t have to know anything about our personal lives, too. It is not worth for you. We say, listen to our music and that’s it. Everything we do is really personal, and “Kein zuruck” is no exception. Now, how we came to the idea about Kein Zuruck… I don’t know really. Markus wrote the most important segments of it, we put it together and after that it was something like a spontaneous idea. The chorus was first created and then I wrote the lyrics for the chorus in a couple of hours. It was like they just fell into my head and I just had to write it. After that, I knew what the song would be about; there was no question of what it should be about. Then I tried to write in this direction, and make a good song out of it. And that took very long time because I tried to say what I wanted in very simple words. I thought that if you listen to it – in German – you don’t have to think about the lyrics. You have to listen to it, to feel it and understand it immediately. You can think about the meaning of the song without having to know the words, and you can think of what it could mean about your own life. LE: I think this song touched a lot of people. Peter Heppner : Yeah. We realized that. In Germany we had very overwhelming reactions to this song. A lot of people came to us and told us “this is the song of our lives and thank you for writing it”. It was very moving. We didn’t do that in purpose, it just happened! LE: In the past your music was a bit darker. More melancholic than it is now. The lyrics seemed to explode darker parts of the human soul the human behaviour but now with Casting Shadows it seems like you have brightened up a bit… and you’ve been happier, both in the music and the lyrics. What brought about this change? Was it growing up and thinking in different terms? Peter Heppner : You kind of think about what you do and why you’re doing it because you are always so concentrated on this work, you always try to do the best and it takes a very long time, at least for us, because we want the result to be exactly as we want it, to be perfect. With every LP you grow a couple of years older (laughs), because you put a lot of work in it. Markus Reinhardt : Perhaps we’ll know in two or three months what we’ve done with this album. LE: What are your plans regarding a new album? Have you started thinking about a new album? Peter Heppner : First of all we have to take a break from all this music business stuff. We have to live a normal life for a few months and find new inspirations, because we don’t want to write songs about the music business; we want to write about things that move us, about life and everything around us. It is very important for us to have nothing to do with anything from the music business and this is one of the reasons why it takes us so long to record a new album. It takes time, especially when you spend so many months in the studio and you tour and then again you have to go back to the studio because you have to release a maxi single, and after that you have to do some video shootings, the US tour, then come back to Europe, tour with Schiller… We had a lot to do and even write songs for other developing projects I’m working on, so now we have to take a break. It is really difficult to concentrate on what you’re doing when you have so many things in your mind. You have to put a stop at some point and say that now things have to get more private and you just play in festivals, only weekends and not on long tours. LE: Let’s talk about your side projects, outside Wolfsheim. Are they an outlet for you to do things that musically do not fit in the Wolfsheim frame? Peter Heppner : Definitely. This is one of the reasons why we both do a lot of side projects. You know, Wolfsheim is very important to us, Wolfsheim has grown over a very long time and we are very, very careful with what we do within the band.It sets you free when you do other things. You’re working on other styles of music; for example with Schiller it was kind of a dance project. I always thought that you can’t do something wrong if the lyrics you’re writing are slightly deep, certainly much deeper than 99.9% of all the usual dance projects. It was very easy to make decisions regarding the lyrics and afterwards I realized that while it was easy, it wasn’t less important or less good. So in a way working on side projects broadens your horizons because you see different things, more experimental…I did rock songs in Germany! For example with Heal Yourself, then again with Umbra et Imago it was very gothic style, I did a song with Alice II that was kind of rock also, “Glasgarten” with Goethes Erben, which was completely different from everything else, and that’s very interesting, to see that my voice fits in it, and it’s also a very good experience for me. It is very interesting to meet new people and work with them, and also a lot of fun. LE: Is it the same with the music? For example with Care Company, is it something totally different? Markus Reinhardt : It is. It is very important to see that there are other things you can do with the music. As Peter said it’s much easier. We do Wolfsheim since 1987 and we always look for the best. So you must have other experiences and I think it’s great because it takes Wolfsheim further. Peter Heppner : You learn a lot by doing these side projects. LE: So, what is the news about your side projects? We’ve heard that you are doing a project with Paul Van Dyk. Peter Heppner : I’ve finished it last Thursday and it is probably going to be released in the beginning of June. It is going to be used by the ZDF, one of the biggest TV stations in Germany for the anniversary of the world championship winning of Germany in Switzerland in 54 against Hungary. It was a very important victory for the Germans because at that time we had no chances of winning and all the odds were against us. Now we have the 50th anniversary of this event and they asked Paul to write a song for it. He said ok but he thought that the song should have lyrics and he chose me to write them. In the beginning I said “I’m not writing about a football game” (laughs) but he said, “No, no, we don’t want that; we want to have a song about the mood and the feelings of the people, about the time when this happened, and generally lyrics that lead to today”. That’s because nowadays we have a little problem in Germany, as everybody thinks we are not going very well and this is not really true. So it’s in a way similar to the situation we had in ’54 and they thought that maybe a song would make people remember those days and what German football can do. So I tried and maybe I’ve managed it…let’s see! LE: What about Care Company? Do you intend to work with them again? Markus Reinhardt : There isn’t really any news about that at the moment but it is possible that we might write some new songs at the end of the year. A new CD might come in 2005 but we don’t really know yet. LE: When you write music for a new album, do you isolate yourselves completely from what’s going on musically, or do you take inspiration from what’s going on in the music industry and put it in your music? Markus Reinhardt : Trends are not important for us. Peter Heppner : No, trends are not really important for us. It takes so much time for us to do something. If we wanted to put something trendy in it, it would be long gone by the time we finish it, so it doesn’t happen. But we do listen to modern music, to things that are happening today and if there is anything we find interesting it finds its way into Wolfsheim’s music. Wolfsheim represents only what we like at the time we are writing the songs and nothing else. When we like something new we include it, otherwise we don’t. You can see this in “Wundervoll” and it’s dance elements. There are some dance and techno elements in it that are very interesting musically. With this song we wanted to try and see how Wolfsheim would sound with a dance song. It was an experiment that worked. Its lyrics are kind of ironic and critical, because they talk about the club culture and people going to dance without thinking what they are doing. If you don’t pay attention to the lyrics you can think “Oh it’s a really great song…You can dance by listening to it…” We did that on purpose, thinking that if you don’t want to listen to the lyrics then you can just dance to it and enjoy, but pay attention to the lyrics and you’re in for a surprise! LE: Could you mention some groups that you really like nowadays? Peter Heppner : This would be very difficult to answer because for the last 24 months we hadn’t had the time to listen to new things. I think we both listen to a wide variety of music. LE: What about groups that you consider to be classic and you have been listening to for years now? Peter Heppner : In Germany if someone asks us this question we always say that we listen to everything that’s good. We wouldn’t be able to mention all the bands we like so it would be unfair to leave some of them out. Markus Reinhardt : Interpoll is one great band. Another really important band for me is the Nits and I don’t understand why they haven’t had many hits, despite the fact that their albums were actually full of potential hits. LE: I remember reading an interview where you were saying to the people who asked you this question “Oh, we listen to heavy metal”…. Peter Heppner : Ha ha ha! No actually we always say that we listen to everything except Heavy Metal. Markus Reinhardt : And Jazz. Peter Heppner : Yes, and Jazz! Markus Reinhardt : And Reggae! Peter Heppner : Oh, sometimes we do…! In the past… Ha ha ha! There are really a lot of bands. If we wanted to say names we would mention a lot more. In the past there were bands like Eyeless in Gaza for Markus, it was Bauhaus for me, Peter Murphy and his solo projects which were really wonderful. Markus Reinhardt : And Also The Trees, too. Peter Heppner : Yeah, And Also The Trees, too, but in this case it was mostly one album, which was really great. There was also the Cure before “Lovecats”. LE: I remember that you had mentioned that you stopped buying their records after Lovecats! LE: The symphonic version (Praha-Edit) of “Kunstliche Welten” was absolutely amazing! Do you have any plans of recording more of your songs in that way? It would be really interesting. Markus Reinhardt : It’s a question of money! So we’ll try to do that again in the future but we cannot promise anything. LE: In Wolfsheim Markus writes the music and Peter the lyrics. Does this ever change? Do you ever get involved with each other’s work? Peter Heppner : A lot. We always talk about what the other one does and sometimes I do a part of the music, too. Sometimes we talk extensively about the lyrics because I don’t know which direction I should follow, so I ask Markus and we discuss about these things. He has to stand for these lyrics and accept them exactly the same way I have to do it. He can’t write lyrics for me because he couldn’t know what I can sing and what I can’t. But we work really together. Markus is responsible for the music and I am responsible for the lyrics. He is the instrumentalist and I am the singer and the lyric writer. LE: After 17 years of making music…. LE: So, what are your aspirations now? What is your dream, what do you expect out of life? Peter Heppner : To write good music, for us. Actually we always write music just for us. We never do it for anyone else, for the fans or for the record companies. We just write the best music we can. That’s how it works. For the future we wish that we can go on for as long as possible. LE: We’d like to thank you for the interview and the great night we had tonight here and earlier at the concert. We hope you’ll come back to Greece soon. Peter Heppner : We enjoyed the show and we’ll come back as soon as possible, but I don’t know how soon this will be. We will definitely come back for our next tour. It was a real pleasure to be here and it’s shame we didn’t have more time to see Athens. Right now we need to go back home; we’ve been away for too long: We’ve been on the road for the American tour, then we had to do all this studio work, I also had all these other projects besides Wolfsheim and the tour with Schiller… all this has been keeping us away from home for a very long time.